Summer flowering bulbs will beautify any and every garden space graced by their presence, even small gardens. Bulbs don't discriminate. Compact planting spaces, like those of a townhouse, condominium, city garden or even an apartment balcony or fire escape, are easily beautified with bulbs. No exception, summer bulbs are a simple and delightful addition to any garden. Most summer bulbs are often referred to as tender bulbs as most are not winter hardy in Northern climates but some are like Allium and Lilies. What we refer to as "bulbs" may actually be tubers or corms but for the sake of simplicity we will refer to all of these as bulbs. Tender bulbs need to be protected, or lifted and stored, during the winter months. Less expensive bulbs, like gladiolas, may simply be tossed away at the end of the season and purchased fresh next year. To ensure healthy growth and gorgeous flowers, you first need to select bulbs that do well with a sunny exposure if you have predominantly sun and those that do well with less light if you have predominately shade. Most summer bulbs do best in full sun. Begonia, Caladium and Elephant Ears prefer shade. Although all bulbs may be grown in containers as well as in the ground, it is best to know the ultimate size at maturity of the plant that you select to help you choose the proper size container and have enough room for the bulb to develop to its full size. In most cases, this information will be available on the plant packaging. There are many dwarf or small summer bulbs cultivars available for micro-mini gardens like a balcony or fire escape. Space is at a premium in urban and balcony garden, and there are easy ways you can maximize your space for a lush garden. Choose larger containers that can support several plants and group your plants in layers and arrangements that will thrive together so you do not need to crowd your space with too many pots. Think vertically for extra planting space, installing a trellis or green wall to support climbing plants or vines. 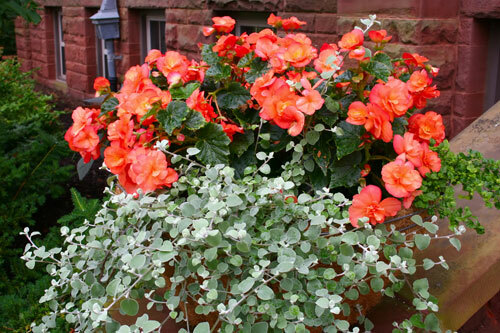 Hanging pots dripping with begonias can also add vertical growing space, multiplying the number of plants in your garden. Window boxes designed to rest securely on railings can give you even more planting space, and don't forget a small pot that can be a centerpiece for a patio table, if you have furniture on your balcony. An urban or small scale bulb garden is super easy to care for but there are a few tricks to be sure that yours will thrive. Because you will be planting exclusively in containers, they will need more frequent watering, especially in the sun, and they are not likely to get adequate water no matter how much it may rain if they are situated on a covered balcony. Be certain to provide planted bulbs with proper drainage by using pots with holes in the bottom and a good quality potting soil to minimize the risk of rot. Elephant Ears are one bulb that can take a little extra soil moisture, however, most bulbs require excellent drainage. Use pot feet to lift containers off the ground to increase drainage and reduce the presence of sow bugs. If using saucers, empty immediately after watering or a soaking rain. Because containerized balcony plants need more frequent watering, they will also need regular fertilizing, as the water gradually washes nutrients out of the potting soil. Using a slow release fertilizer at planting in conjunction with weekly or bi-weekly liquid fertilization will also help ensure your balcony or urban bulb garden has all the nutrition it needs. Rotating plants regularly can help give them enough sunlight even when corners may be shaded, and it is easy to rotate even the heaviest pots if you place them on rolling stands or casters. This can also help you keep the plants growing evenly and will help you more easily change the arrangements of plants as their needs change or seasonal sunlight patterns shift. You also need to be sure you have the proper tools to care for your small space garden. Hand tools are best for gently working with containers and tight spaces. Try different tools to find those that fit most comfortably in your hand and are the easiest to control for precise pruning cuts, easy digging and managing the other tasks you will need to keep your garden at its best. A bulb garden can be a remarkable use of urban space and a great way to add nature into your life, no matter how high up your outdoor space may be.